All advertising accounts are due and payable as invoiced. Interest charges of 1.5% per month (18% annual interest rate) will be assessed to accounts 30 days past due. All advertising copy (including photos) must be in this office by the 25th of the second month preceding publication (i.e., July 25 for September issue) or first working day thereafter. Although we devote the utmost care to the preparation of each advertising insertion, we cannot be responsible for errors made when copy is received after the deadline or by phone. Requests for advertising layouts must be in this office by the 15th of the second month preceding publication (i.e., July 15 for September issue). Requests for proofs must be received or postmarked by the 20th of the second month preceding publication. Requests after these dates will be filled only so long as the production schedule permits. Alterations in advertising copy, if requested after closing date, will be made only if time permits and will incur the 10% surcharge on total advertising space, plus appropriate charges for time and materials involved in the copy change. The ANGUS JOURNAL reserves the right to refuse any advertising or copy at its sole discretion. The ANGUS JOURNAL assumes no responsibility for the accuracy of the advertising or copy content as submitted. Advertisers assume all responsibility for the accuracy and truthfulness of submitted advertising or copy, including advertising or copy containing pedigrees and statements regarding performance or animal traits. Advertisers shall indemnify and hold harmless the ANGUS JOURNAL for any claims concerning advertising or copy content as submitted. CONSENT, DISCLAIMER, WAIVER AND RELEASE: For advertising or copy that includes EPD statistics, the ANGUS JOURNAL will publish, and may revise, the advertising to show the most current applicable EPD statistics that exist in the AMERICAN ANGUS ASSOCIATION records, and any advertiser submitting such advertising or copy EXPRESSLY CONSENTS that such revision and publication may be made. The ANGUS JOURNAL EXPRESSLY DISCLAIMS liability to any person for any errors or omissions in the publication of said EPD statistics in said advertising, except as specifically provided below. Further all advertisers EXPRESSLY WAIVE all claims against, and EXPRESSLY RELEASE from all liability, the ANGUS JOURNAL and the AMERICAN ANGUS ASSOCIATION for any errors or omissions in the publication of said EPD statistics in said advertising, except as specifically provided below. For advertiser-submitted advertising or copy published by the ANGUS JOURNAL, the ANGUS JOURNAL EXPRESSLY DISCLAIMS, and all advertisers hereby waive, all liability for all damages claimed or incurred (including actual, consequential, special, punitive or incidental damages) by any person in reliance on said advertiser-submitted advertising or copy, it being agreed that customers of such advertisers must seek recovery directly from such advertisers. 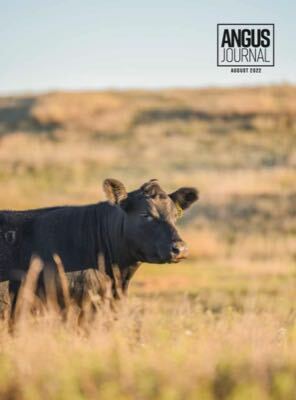 In addition, the ANGUS JOURNAL and the AMERICAN ANGUS ASSOCIATION MAKE NO REPRESENTATIONS, WARRANTIES (INCLUDING ANY IMPLIED WARRANTIES OF MERCHANTABILITY, FITNESS FOR A PARTICULAR PURPOSE OR NON-INFRINGEMENT) OR ENDORSEMENTS OF ANY GOODS OR SERVICES ADVERTISED HEREIN. LIMITATION OF LIABILITY FOR ERROR: Advertisers expressly waive, and the ANGUS JOURNAL expressly disclaims, any liability for any error in any advertisement published hereunder, except that if a proof of such advertisement is requested in writing by Advertiser and returned to ANGUS JOURNAL with the error or correction plainly noted in writing thereon, by the first of the month prior to publication date, and any error so noted is not corrected by ANGUS JOURNAL, then ANGUS JOURNAL's liability will not exceed the proportion of the entire cost of such advertisement as the space occupied by the noted error bears to the whole space occupied by the advertisement. Charges dependent upon stage of production will be invoiced to advertisers who cancel previously submitted advertising. All rights reserved by Angus Media No part of this publication may be transmitted or reproduced in any form, electronic or mechanical, without permission in writing from the editor. Opinions expressed are those of the writer and not necessarily those of the ANGUS JOURNAL. Photographs and manuscripts are welcome, but no responsibility is assumed for such material either while in transit or while in this office. Advertising and editorial reprints available. Contact the office for prices 816.383.5200. Effective with the March 2001 issue, advertising for sales scheduled in the month of publication will be accepted at the advertiser's risk. ANGUS JOURNAL assumes no financial responsibility for distribution. All advertising copy (including photos) must be in this office by the date listed above. Although we devote the utmost care to the preparation of each advertising insertion, we cannot be responsible for errors made when copy is received after the deadline or by phone. Requests for proofs must be received by the ad deadline date. Requests after these dates will be filled only so long as the production schedule permits. The ANGUS BEEF BULLETIN reserves the right to refuse any advertising or copy at its sole discretion. The ANGUS BEEF BULLETIN assumes no responsibility for the accuracy of the advertising or copy content as submitted. Advertisers assume all responsibility for the accuracy and truthfulness of submitted advertising or copy, including advertising or copy containing pedigrees and statements regarding performance or animal traits. Advertisers shall indemnify and hold harmless the ANGUS BEEF BULLETIN for any claims concerning advertising or copy content as submitted. CONSENT, DISCLAIMER, WAIVER AND RELEASE: For advertising or copy that includes EPD statistics, the ANGUS BEEF BULLETIN will publish, and may revise, the advertising to show the most current applicable EPD statistics that exist in the AMERICAN ANGUS ASSOCIATION records, and any advertiser submitting such advertising or copy EXPRESSLY CONSENTS that such revision and publication may be made. The ANGUS BEEF BULLETIN EXPRESSLY DISCLAIMS liability to any person for any errors or omissions in the publication of said EPD statistics in said advertising, except as specifically provided below. Further all advertisers EXPRESSLY WAIVE all claims against, and EXPRESSLY RELEASE from all liability, the ANGUS BEEF BULLETIN and the AMERICAN ANGUS ASSOCIATION for any errors or omissions in the publication of said EPD statistics in said advertising, except as specifically provided below. For advertiser-submitted advertising or copy published by the ANGUS BEEF BULLETIN, the ANGUS BEEF BULLETIN EXPRESSLY DISCLAIMS, and all advertisers hereby waive, all liability for all damages claimed or incurred (including actual, consequential, special, punitive or incidental damages) by any person in reliance on said advertiser-submitted advertising or copy, it being agreed that customers of such advertisers must seek recovery directly from such advertisers. In addition, the ANGUS BEEF BULLETIN and the AMERICAN ANGUS ASSOCIATION MAKE NO REPRESENTATIONS, WARRANTIES (INCLUDING ANY IMPLIED WARRANTIES OF MERCHANTABILITY, FITNESS FOR A PARTICULAR PURPOSE OR NON-INFRINGEMENT) OR ENDORSEMENTS OF ANY GOODS OR SERVICES ADVERTISED HEREIN. LIMITATION OF LIABILITY FOR ERROR: Advertisers expressly waive, and the ANGUS BEEF BULLETIN expressly disclaims, any liability for any error in any advertisement published hereunder, except that if a proof of such advertisement is requested in writing by Advertiser and returned to ANGUS BEEF BULLETIN with the error or correction plainly noted in writing thereon, by the first of the month prior to publication date, and any error so noted is not corrected by ANGUS BEEF BULLETIN, then ANGUS BEEF BULLETIN'S liability will not exceed the proportion of the entire cost of such advertisement as the space occupied by the noted error bears to the whole space occupied by the advertisement. All rights reserved by Angus Media No part of this publication may be transmitted or reproduced in any form, electronic or mechanical, without permission in writing from the editor. Opinions expressed are those of the writer and not necessarily those of the ANGUS BEEF BULLETIN. Photographs and manuscripts are welcome, but no responsibility is assumed for such material either while in transit or while in this office. Advertising for sale dates prior to a specified date three weeks following a mail date is accepted at the advertiser's risk. ANGUS BEEF Bulletin assumes no financial responsibility for distribution.